Mt. 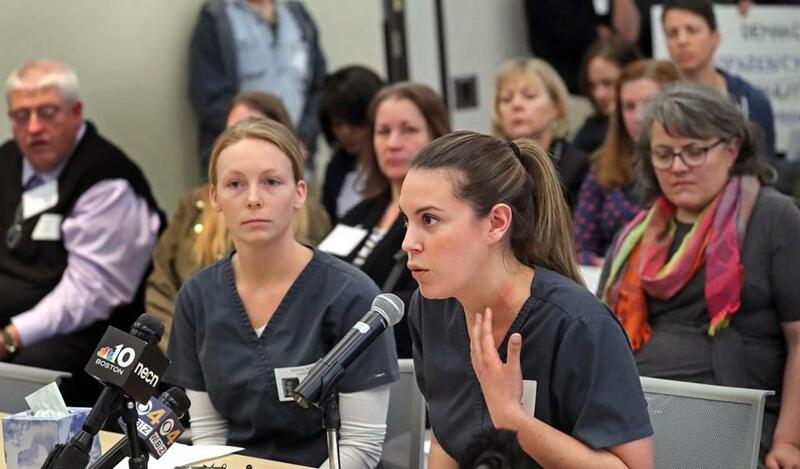 Ida dental hygienist students Colleen Morney and Latish Derepentigny spoke at a meeting in April about the school’s closing. In a letter detailing for the first time its investigation into the chaotic closure of Mount Ida College last year, Attorney General Maura Healey’s office on Wednesday called for tighter oversight of colleges, but stopped short of suing Mount Ida officials. The 14-page letter, sent to the state higher education commissioner, outlines the findings of Healey’s investigation into the closure of the small, private liberal arts college in Newton last spring. Her probe found that school officials’ actions raised “serious questions” about whether they obeyed their legal obligation to act in the school’s best interest and said they “may well have violated” state consumer protection laws. “At a minimum, their decision-making fell short of what is expected of a charitable board in meeting its obligations to an educational mission,” the letter said. But at the same time, Healey’s office said a lawsuit would be costly, time-consuming, and “of limited public benefit” because the school is closed and has virtually no assets. Instead, the letter said it is more important to disclose the findings to set an example for other colleges in the future and also as a way to call for increased oversight. In the months since Mount Ida’s closure, several other colleges in New England have announced they will close, including Newbury College in Brookline, whose shutdown has been orderly. The attorney general’s letter recounts the events that took place leading up to and in the wake of Mount Ida’s announcement in April that it would close. The investigation concluded, as has been previously reported, that Brown and the trustees had ample notice of the school’s precarious financial condition, detailing the years of declining assets and mounting costs. It details how the school relied on increasingly exotic mechanisms, particularly from a shadowy private entity, for lending and gifts. The letter emphasizes how Brown and the Mount Ida board, knowing their financial picture, failed to create a contingency plan for closing the school and allowing their students to transfer smoothly to other institutions. After reading the letter Wednesday, the former Mount Ida president and the former trustees lashed out, calling it inaccurate. Former president Barry Brown’s attorney also said Healey’s office presented its findings to Mount Ida attorneys last fall and threatened a lawsuit if they did not pay a settlement. The Mount Ida officials refused to pay “one cent” because they said they did nothing wrong, the statement said. “After months of silence, the Attorney General’s decision today to decline to pursue litigation followed. That decision speaks volumes,” said Brown’s lawyer, Howard Cooper, in the statement. The statement called the letter “woefully replete with inaccuracies,” though it did not elaborate. A separate statement from the former trustees also accused the letter of inaccuracies and praised the decision not to sue. “As we have maintained from the start, there were no violations of law. The College’s leadership undertook extraordinary efforts to support its students and employees during exceptionally difficult circumstances,” said the statement, sent by a spokeswoman on behalf of the former trustees. Asked about the allegations of inaccuracies, Healey’s office said it stands by the letter. The letter was sent to Carlos Santiago, the state higher education commissioner, who praised its findings, saying they concur with his department’s assessment of what happened at Mount Ida. He called the decision not to sue “reasonable,” because the attorney general did not find anyone stole from the school and because it has virtually no assets left. Santiago said the letter is a useful document for other colleges to review because it shows how complicated these situations are and the potential pitfalls. “There’s a right way to do this, and I think the document shows that there is certainly a wrong way to do some of this,” Santiago said. The letter uses the facts of the Mount Ida case to underscore Healey’s push for stronger oversight. In the wake of the Mount Ida closure, Santiago’s department has been working on new regulations that will help state officials keep tabs on private colleges’ finances. The new system is designed to alert officials sooner to schools that are potentially on the verge of collapse. In addition, last week Governor Charlie Baker filed legislation to the same effect. Healey’s office has also previously called for a new state office to oversee this new monitoring, which she reiterated in the letter. Healey’s letter acknowledged a common concern voiced by colleges — that disclosing information about their precarious finances might make closure a self-fulfilling prophecy. But her office said the public good outweights that worry. Healey’s letter said it is in the public good for students, professors, and potential applicants to have a more complete picture. “While the [attorney general’s office] respects the need for confidentiality through the monitoring process . . . the Mount Ida experience highlights the critical need for college and university communications with students and prospective students to disclose risks,” the letter said.